Hello Friends! I am participating in the newest Online Card Class. It's called Insider. We are learning new ways of decorating the insides of our cards! Today was the first day of class and let me tell you, it was JAM PACKED with information! My head was spinning after watching all of the videos. This is a short class only three days, it's not too late to sign up. Consider joining us, it's a lot of fun and I learned SOOO much in just day one! As you can see, I'm getting some mileage out of my GinaK Designs Stamp TV kit. I absolutely adore this pumpkin image! 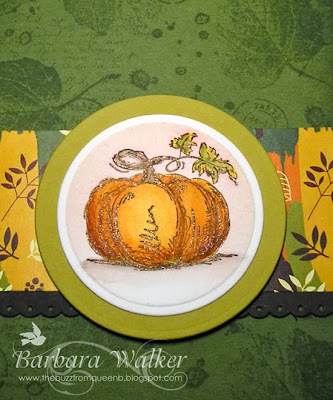 Today, I stamped it onto water color paper and colored it with Distress Markers. We also went over that technique in class today. Jennifer McGuire is THE Master when it comes to Distress coloring. 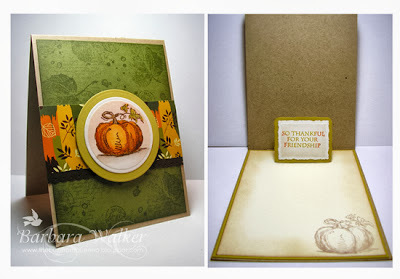 I created the green layer by random stamping images from a Stampin' Up set, French Foliage, which I love! I used Versamark ink to stamp the images and to sponge the edges. This way, I get a tone on tone look, that adds interest without pulling the eye away from the focal. I used a few Wink of Stella Glitter markers on the image, too. Can I just say that I am in LOOOOOOVE with these markers?! They have a fine tip that gets into the smallest of spaces and they deliver just the right amount of glitter. They can be used for writing or coloring. And after my water colored image dried, I went over it with the Stella markers. Of course, my camera is not picking up the shimmer, but, if you click on the image to enlarge it, you'll get a glimpse of it. Soooo special! I just love it! The greeting pops-up when the card is opened! It's so cute! I didn't think making a pop up would be so easy, but it's SUPER simple and I will definitely be using this technique again. 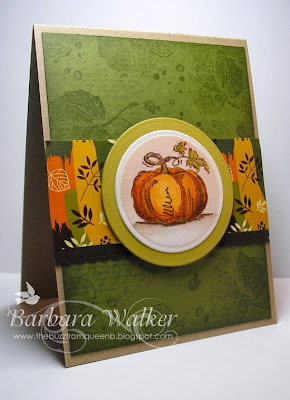 As usual, I try to have my inside match my outside in some way and this time, I repeated the pumpkin image. That's all I have to share today. Thank you so much for visiting! Your card is amazing - the outside is gorgeous and the pop up sentiment just blows me away! I have to admit, I've been kind of missing you and your posts and then today, two from you when I scroll through Feedly. Awesome! A double dose of fabulous cards. Yay! Love that you are taking a fun class and sharing what you create with us. Wonderful work on the card. Your attention to detail always wows me and helps you create cards that mini works of heart. Well done! Enjoy the class! Such a beautiful card and I really love the soft muted repeat you did on the inside, just lovely. I just love your card. Such beautiful coloring Inside and out. Thanks for sharing.